The National Health Service is turning 70 on 5 July 2018. We want to celebrate the achievements of one of the nation’s most loved institutions, to show our appreciation of the vital role the service plays in our lives, and to recognise and thank the extraordinary NHS staff – the everyday heroes – who are there to guide, support and care for us, day in, day out. 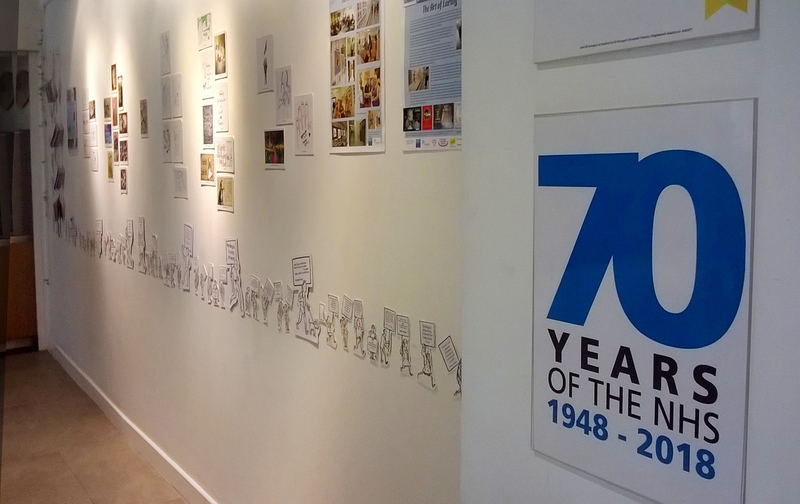 St George's Hospital in London have asked us to put on a special Art of Caring exhibition in their gallery space to help celebrate the 70th birthday of the NHS. The exhibition charts the history of the Art of Caring throughout its brief history (only 4 years!) and showcases some of the written and pictorial contributions from artists in 2018. Come and see for yourself from the 5th - 22nd July in the gallery space in Ingredients Restaurant, Lanesborough Wing, St George Hospital, London, SW17 0QT. 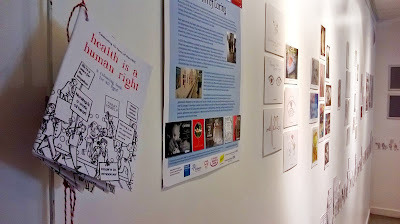 This year for the Art of Caring we wanted to mark the NHS' birthday with awards for both Art and Writing. The prizes for these awards have been generously donated by the staff at the Faculty of Health, Social Care, and Education at Kingston University and St George's, University of London. We're excited to announce that Danny Mooney is the winner of the Art Prize and Latoya Igbinosun the Writing Prize. Latoya Igbinosun is currently studying Adult Nursing at Kingston University and St George's, University of London. Here at the Art of Caring we are also publishing a new book to accompany our bestselling 2016 chapbook Resilience. 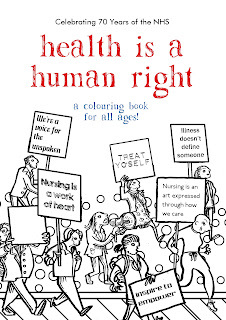 Health is a Human Right is 16 page colouring book published by Sampson Low Ltd. Over 200 nursing students from Kingston University and St George’s University of London tapped into their creative juices to produce inspirational writing on the 2018 International Nurses’ Day theme ‘A Voice to Lead: Health is a Human Right’. 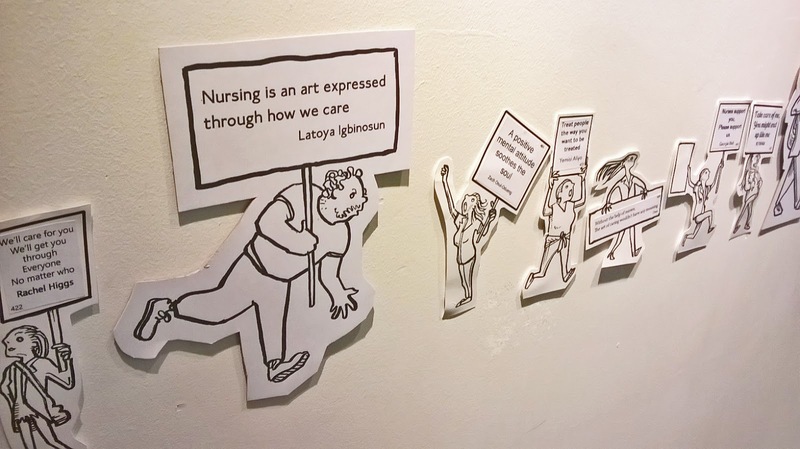 The Art of Caring is an inclusive art exhibition that celebrates the role of nurses and carers on International Nurses’ Day (12th May) each year. The first Art of Caring was held at The Rose Theatre, Kingston-upon-Thames in 2015 and featured 252 artworks from 133 artists. 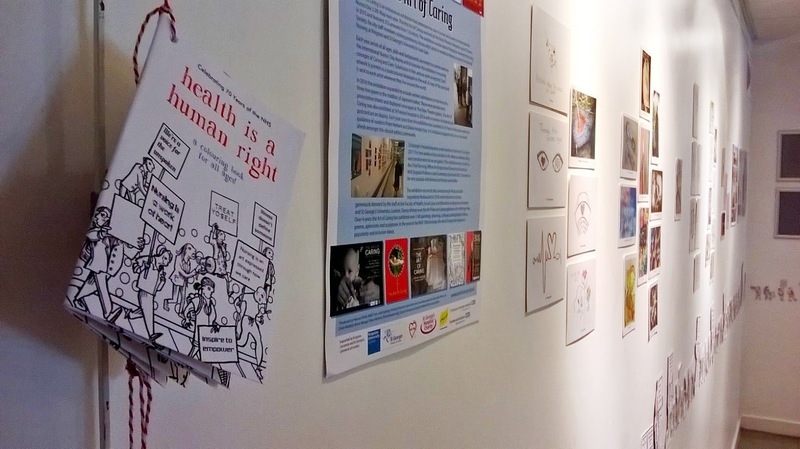 The exhibition was the idea of Kingston University Nursing Society, faculty staff members, visiting professors, the faculty’s artist-in-residence Alban Low and the Head of Nursing at Kingston and St George’s, University of London Dr Julia Gale. 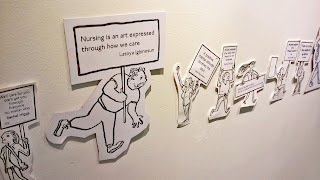 Each year artists of all ages, skills and backgrounds are invited to submit work on the International Nurses’ Day theme and to consider the exhibition’s recurring concepts of Caring and Care. Submission is free, and no work is rejected. Each artwork is printed as a postcard and displayed on the wall. A copy of the postcard is sent to each artist wherever they live around the world. In 2016 the exhibition expanded to include written submissions in the form of a three line poem in the tradition of Japanese haikus. These were printed onto prescription sheets and displayed once again at The Rose Theatre gallery. 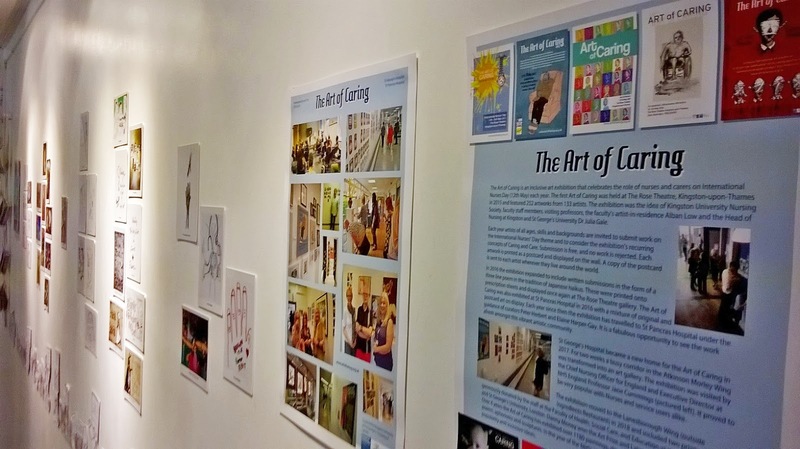 The Art of Caring was also exhibited at St Pancras Hospital in 2016 with a mixture of original and postcard art on display. 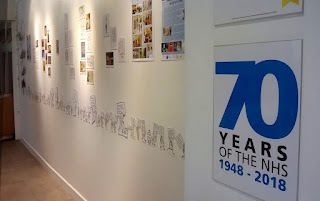 Each year since then the exhibition has travelled to St Pancras Hospital under the guidance of curators Peter Herbert and Elaine Harper-Gay. It is a fabulous opportunity to see the work afresh amongst this vibrant artistic community. St George’s Hospital became a new home for the Art of Caring in 2017. For two weeks a busy corridor in the Atkinson Morley Wing was transformed into an art gallery. The exhibition was visited by the Chief Nursing Officer for England and Executive Director at NHS England Professor Jane Cummings. It proved to be very popular with nurses and service users alike. Over 4 years the Art of Caring has exhibited over 1180 paintings, drawings, collages, photographs, haikus, poems, aphorisms and sculptures. 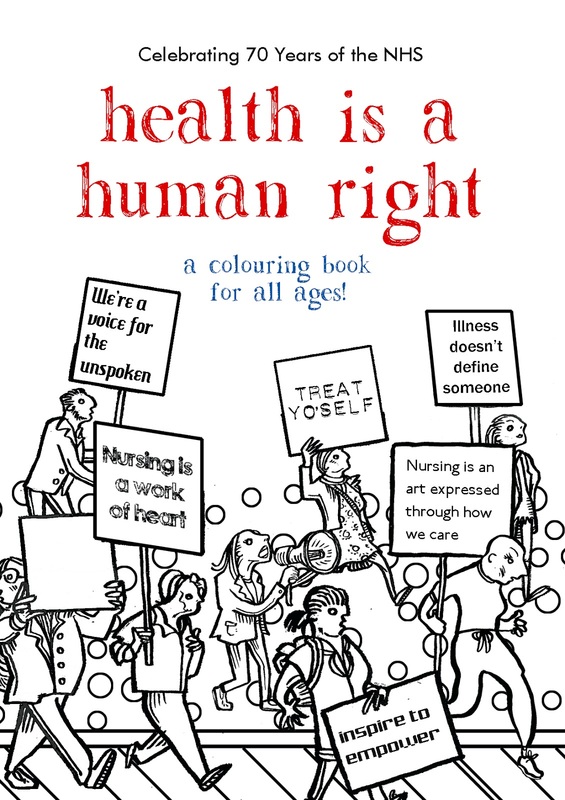 In the year of the NHS’ 70th birthday the Art of Caring still retains its popularity and inclusive ideals.